Jose Mourinho has been sacked by Manchester United after a disastrous first half to the Premier League season. Mourinho’s two-and-a-half year reign came to an end on Tuesday morning following the club’s worst start to a top-flight season since 1990. His last game was a 3-1 defeat to Liverpool at Anfield on Sunday. The club released a statement on their website which read: ‘Manchester United announces that manager Jose Mourinho has left the club with immediate effect. ‘The club would like to thank Jose for his work during his time at Manchester United and to wish him success in the future. 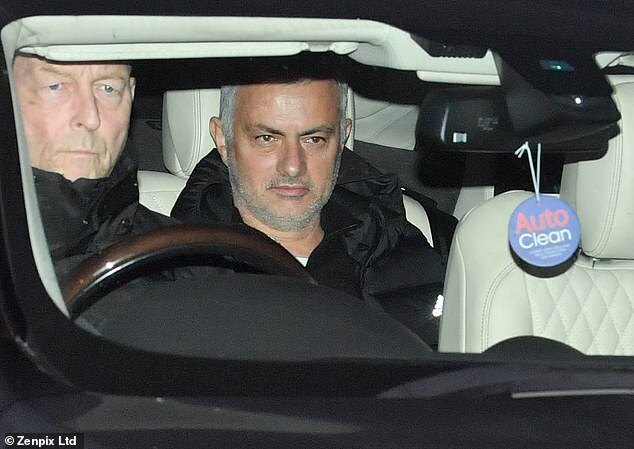 Mourinho, who was pictured arriving at Carrington at 9am, just minutes before being sacked on Tuesday, is set to receive a £22.5m pay-off with the club still in the Champions League. United hope to announce a caretaker manager to see out the rest of the season within 48 hours. Current assistant Michael Carrick is not expected to take the role but sources say the appointment will be a man with strong links to the club. Mourinho had often suggested he had not been backed sufficiently in the transfer market. However, United officials do not share that view. 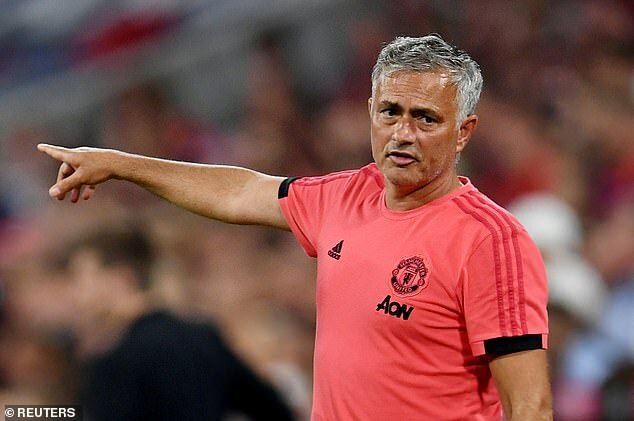 Mourinho brought in 11 players, understood to have been his choices, at a cost of around £400m and those in charge believe he was given every opportunity to succeed. There was also considerable friction over United’s plans to bring in a director of football or technical director, plans they will continue to push on with. They will now turn their attention to finding Mourinho’s replacement. An extensive search will be carried out, with officials hoping for a long-term appointment who can ensure the club challenge for a Premier League title they have not won since 2013. Zinedine Zidane and Mauricio Pochettino are among the leading candidates to replace him, while assistant coach Carrick would be a popular choice to step in as caretaker manager. United drew Paris Saint-Germain on Monday in the last 16 of the Champions League. The players were given the day off but have spoken for some time about it being a matter of when, and not if, Mourinho is sacked. The mood at the club is said to be desperate and he had almost no support left in the dressing-room before his sacking on Tuesday morning. 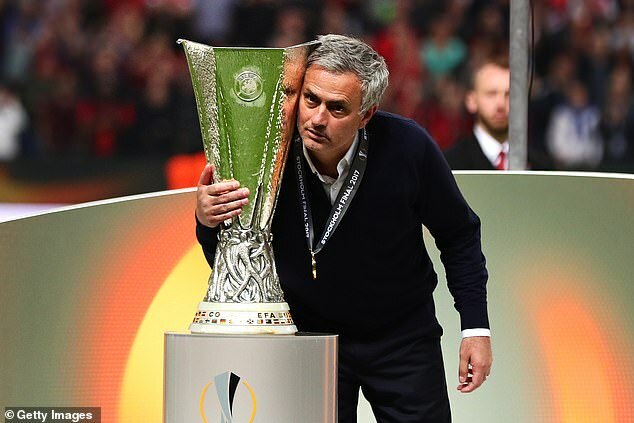 The heady days of summer see Paul Pogba praise his manager, saying he deserves the moniker of ‘the Special One’ after the Portuguese manager oversees FA Cup and Europa League success in his maiden season. After a run of poor results include a League Cup defeat to Bristol City, Mourinho laments how Manchester City are capable of spending ‘striker money’ on full-backs. Although he has already spent £300million players, he says that is not enough. Jose Mourinho signs a new contract with Manchester United on 26 January. The emboldened Portuguese coach begins to take a tougher line with his squad. The club suffer defeat against Tottenham at Wembley, with Paul Pogba substituted just after an hour. After the Spurs loss Pogba is then dropped for United’s trip to Huddersfield and then hauled off again after 60 minutes as United go down to lowly Newcastle. The former Juventus midfielder was again on the bench for Manchester United’s dire first leg 0-0 draw with Sevilla in the Champions League, with youngster Scott McTominay taking his place. 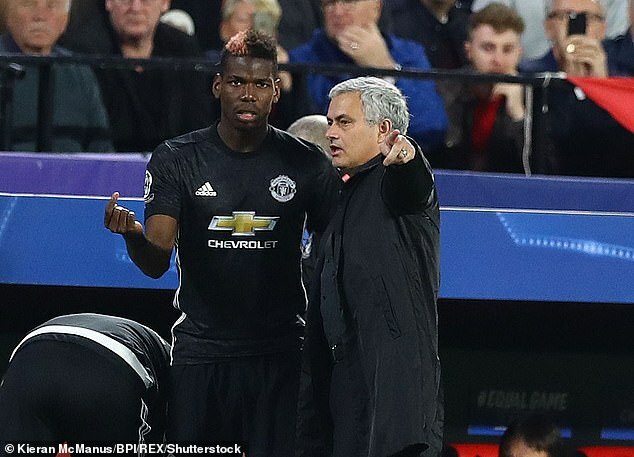 Pogba had withdrawn from United’s FA Cup match against Huddersfield due to illness four days prior, which did not go down well with Mourinho. Although Pogba was later brought on after 17 minutes in Seville after Ander Herrera was subbed off injured, his omission leads to speculation that the France international’s relationship with Mourinho has deteriorated. The Sun report Mourinho is barely on speaking terms with Pogba and he is instead only communicating with the player through his assistant, Rui Faria. United suffer defeat at Brighton on 5 May, completing a hat-trick of defeats against the newly promoted sides. Mourinho criticises Marcus Rashford and his back-up options in attack. ‘Now you have your answer to ‘Why always Lukaku?’ Mourinho said after the game. ‘We are not as good individually as people think we are. ‘The players who replaced others didn’t perform at a good level and when individuals don’t perform at a good level it’s difficult for the team to play at a good level. A summer of discontent lies ahead as Mourinho becomes frustrated at United’s lack of transfer activity. He reveals he had a list of five potential targets after the Red Devils lose 4-1 to Liverpool in their International Champions Cup match in Michigan. Antonio Valencia and Anthony Martial are both criticised by Mourinho after the Liverpool defeat. 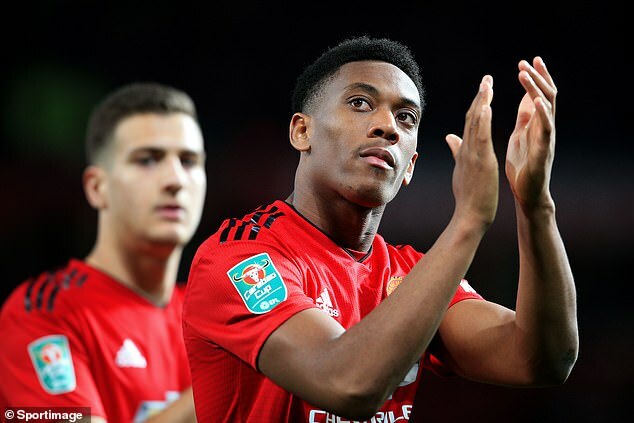 Valencia is accused of being in a poor condition and having ‘too much’ holiday, while Martial, who left United’s pre-season training camp for the birth of his second child, also came under fire. Speculation grows that the former Monaco winger will leave the club before the transfer window closes. 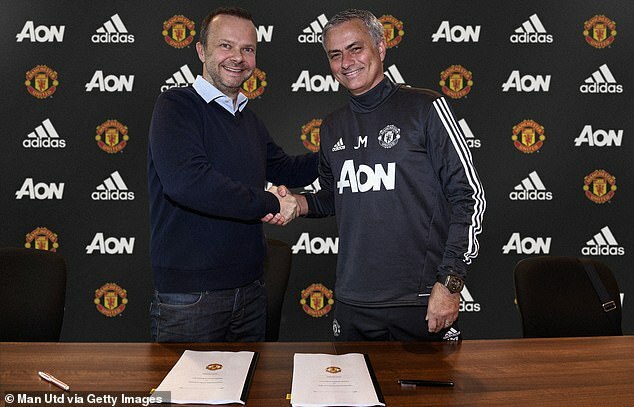 As rumours swirl of a rift between the Manchester United manager and executive vice chairman Ed Woodward following a disappointing transfer window, Mourinho says he has ‘no problem’ with his boss at a press conference. Those words were heard by very few reporters, as the former Real Madrid manager turned up 30 minutes early, and left after less than five minutes. United endure their worst start to a new season for 26 years, losing two of their first three matches. Mourinho suffers the biggest home defeat of his career against Tottenham, a 3-0 loss, on 27 August. The next day, Mourinho demands respect from journalists before walking out of a pre-match press conference. The build-up to United’s League Cup tie with Derby is overshadowed by the news that Pogba has been stripped of the vice captaincy by Mourinho. The £89million record signing is told by his furious boss that he will never captain the club again. United lose to Derby on penalties, with Mourinho saying after the game that he knew they were in trouble when Phil Jones stepped up to take a spot-kick. 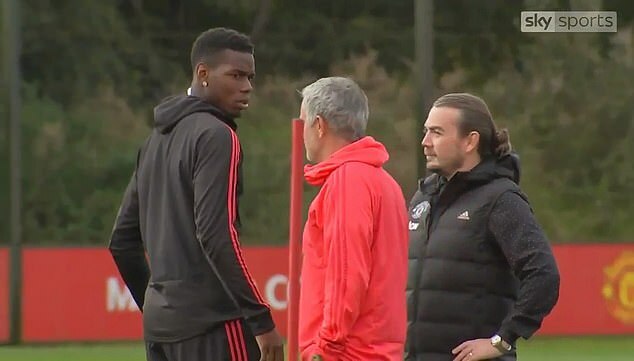 The next day sees images of a frosty confrontation between Mourinho and Pogba on the training ground at Carrington broadcast across the world. It transpires the discussion was about a flippant Instagram post put up by Pogba just after full-time at Old Trafford. Mourinho lasted just 13 more games after that victory over Newcastle. He leaves the club 19 points off the top of the Premier League table after a 3-1 humbling at the hands of rivals Liverpool on Sunday. Manchester United confirmed his departure in a statement on the morning of December 18, almost exactly three years to the day that Chelsea sacked him.